As deer seasons close across the country, many hunters begin to anticipate the upcoming shed season and for good reason, as this is a great way to extend your time outdoors and collect some bone. When I first began shed hunting it would take me all season to find one or two antlers and it took five or more years for me to begin consistently picking up sheds. I want to translate my working knowledge on consistently finding sheds to you so that you can pick up this sport much quicker. This will be a crash course on three basic principles of shed hunting: when to should hunt, which areas to shed hunt, and how to spot sheds. Let’s get started! Deer shed their antlers every winter after breeding is over (read more about deer antlers here), and as a general rule of thumb sheds will begin dropping in mid-January and continue through April. There are some exceptions to this rule, such as deer in Alabama that aren’t finished breeding until late February, but across the country March is a prime month for antler drop. 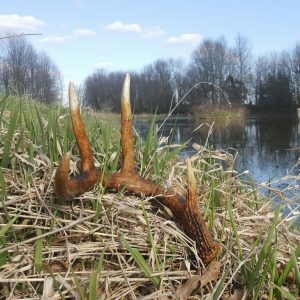 When planning your shed hunts consider whether or not the majority of deer have dropped where you are, which is best learned by monitoring bucks with trail cams or waiting until mid-February or March to begin looking for antlers. Some hunters will even shed hunt areas repeatedly throughout the spring as antlers drop, finding them before other hunters pick them up or rodents chew on them. I personally begin my shed hunting season the first week of February and slowly ramp up my hunting effort until mid-March when I hit my stride and shed hunt as hard as possible through spring green-up. This brings up another factor to consider, the window of time that sheds are visible and not obstructed by vegetation. As spring green-up occurs it becomes increasingly difficult to spot sheds as new growth covers them up. 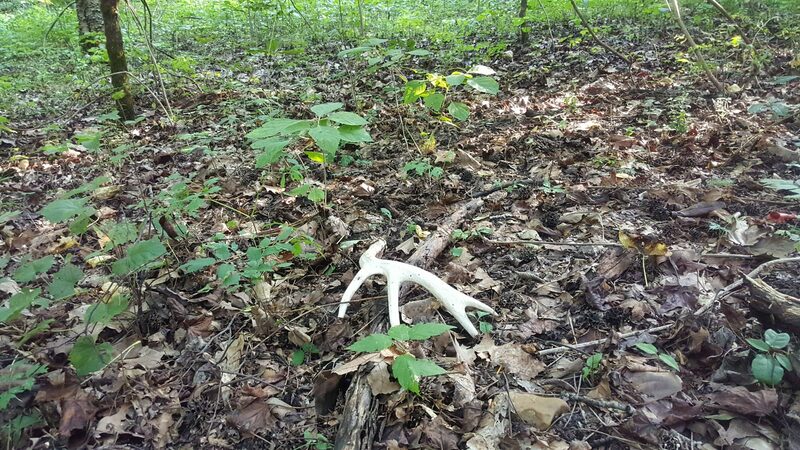 With all of these factors considered, there is a magic window of time for shed hunting that occurs right before spring green-up. For most of the country I believe the last two weeks of March and the first two weeks of April are ideal. I have spent many a day shed hunting areas that apparently were not holding bucks and therefore had no shed antlers to offer. Eliminating these areas before you spend time hunting will limit frustration and optimize your time in the woods. Ideally you will have some intel from trail camera photos or observations of bucks to confirm that an area is holding bucks during the late-season when they are shedding. Once you have selected a good property or area, shed hunt it by targeting specific areas, I like bedding, heavy trails, and feeding areas. When you find a shed, slow down and begin searching the surrounding area diligently, as often deer will shed both sides close together. 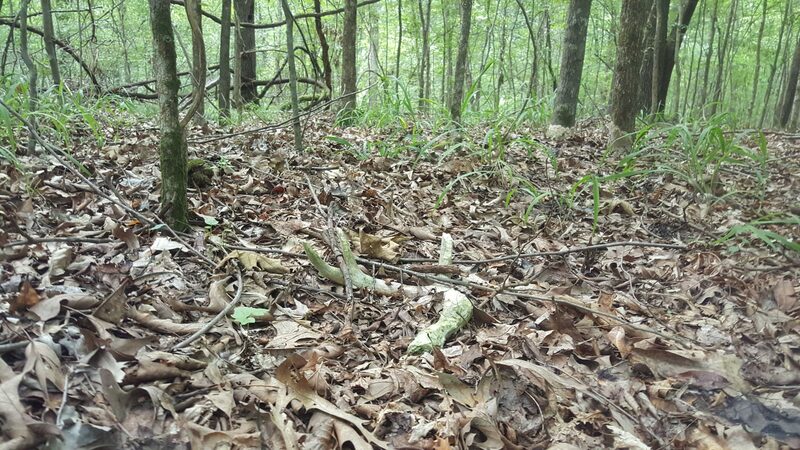 Bedding areas that have dense vegetation for security and a noticeable amount of deer sign are my favorite features to shed hunt and are usually where I begin my search. I like to target multiflora rose and privet thickets or old fields with a substantial amount of brambles. These areas offer some amount of food along with security, making them a favorite site for deer to hold tight after dodging bullets all season. Work bedding areas on heavy trails and keep your eyes scanning for beds and sheds; if deer sign becomes especially heavy, slow down and take your time scanning the forest floor sheds are likely nearby. As I exit a bedding area I think about where deer are feeding and try to locate the most traveled trails leading to these areas from bedding. I concentrate on heavy trails and areas where these trails coincide with new cover types. If I find a good edge, whether the edge of a field or the transition between two forest types, I will generally walk them in a zig-zag pattern dipping back and forth across the transition. If I happen across other trails that look or feel more promising I will change course and follow my instinct. 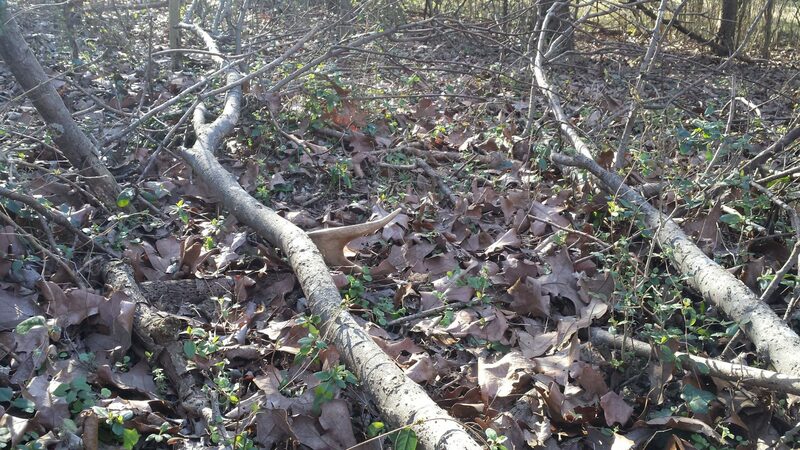 If you find a late-season feeding area (usually food plots, ag fields, privet thickets, or red oaks) slow down and grid search the area, taking care to cover it methodically and completely. These areas can be dynamite for sheds as late-season bucks spend lots of time feeding to replace energy stores spent during the rut. 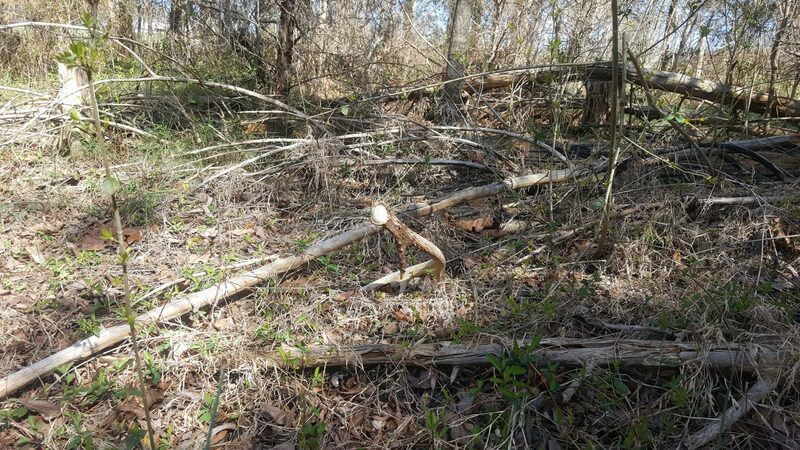 These areas are also a favorite shed hunting spot with most shed hunters, so on public land it may be worth your effort to walk these areas repeatedly so that you will find sheds as they are dropped and before others pick them up. Focus on these three features (bedding, heavy trails, and feeding areas) when getting started, but don’t be afraid to wander and just go where your intuition leads. If you have spent any amount of time observing deer you have some sort of instinct of areas they like to spend time. Some of my favorite sheds have been found in random places I was traveling through to access better areas or was walking because I just had a gut feeling that it looked good. The more you shed hunt the more you will develop this sense of “good” vs. “bad” areas for finding sheds and soon you will walk through the woods with no destination in mind but curiosity for what may be lying around the next corner. I liken shed hunting to riding a bicycle- it can be very difficult at first and lead you to believe that you will never be able to do it but once you have that first bit of success you will pick it up quickly. Along with success comes experience and experience will help you grow into a more successful shed hunter. You will begin to develop a knack for spotting antlers (not always easy) and will eventually spot some that will leave you surprised and your confidence bolstered. When first beginning you must mentally develop a “sight picture” of what you are looking for. This is particularly difficult as you do not know what size the antler is, what position it’s in (tines up, tines down, hanging in a bush, etc. ), or even that there is necessarily an antler out there to find! 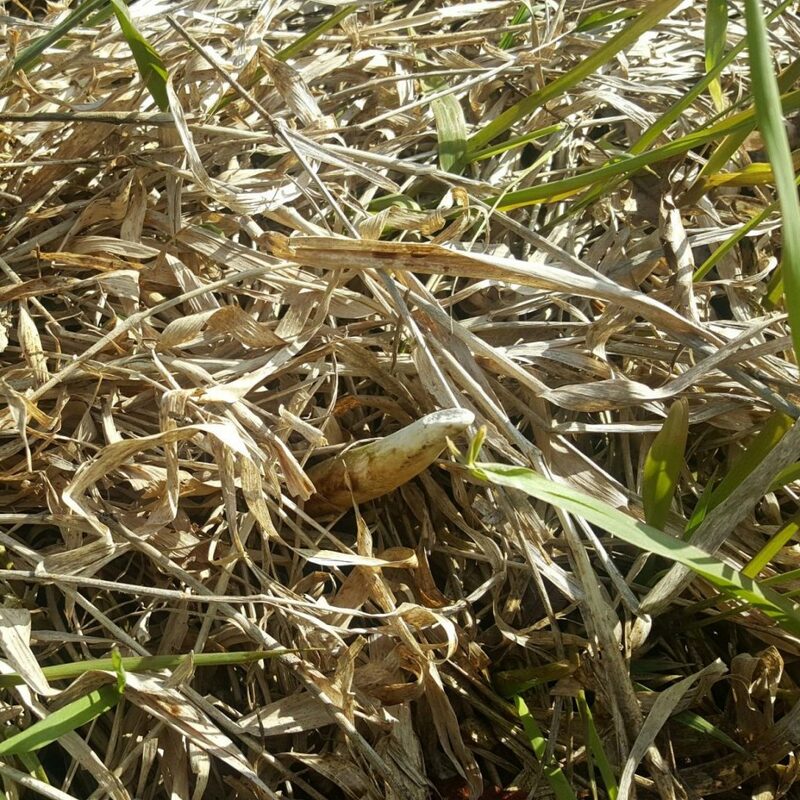 This challenge is what makes shed hunting so rewarding, you are looking for a needle in a haystack and you aren’t even sure there is a needle there! (Above) Not all sheds are as easily spotted as this one, so developing an eye for the wide array of possible positions sheds can be found in very important! To develop your sight picture think about the most eye catching features of an antler, such as antler points, the curve of a main beam, or the bright white round pedicle. Now, as you walk through the woods picture how these features would appear lying in the vegetation. An antler may be on top of the leaf litter, below the leaf litter, bleached, or stained. You need to visualize all of these scenarios and think about how you would spot them in the area you are searching. One of the best ways to develop this skill is to take an antler and throw it in front of you as you walk and see its noticeable characteristics while lying on the ground. When you become more comfortable with your ability, throw the antler behind you and then try picking it out of the cover with your eyes while not knowing its exact location. This can be tough at first, but you will soon get the hang of it! 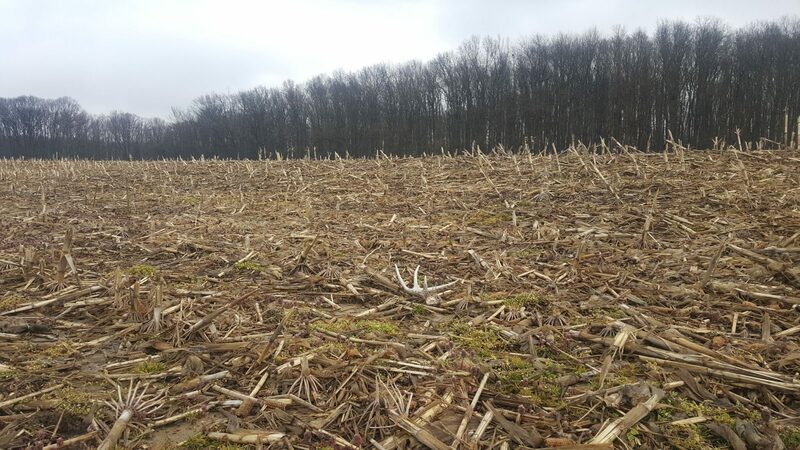 (Above) Cornfields can be dynamite spots to find sheds as deer spend lots of time feeding in them after season if there is waste grain available. (Above) Keep an eye out for the white round circle created by antler pedicles! (Above) This antler blends so well with the background of oak leaves that it took a few seconds of studying this spot before I spotted it. 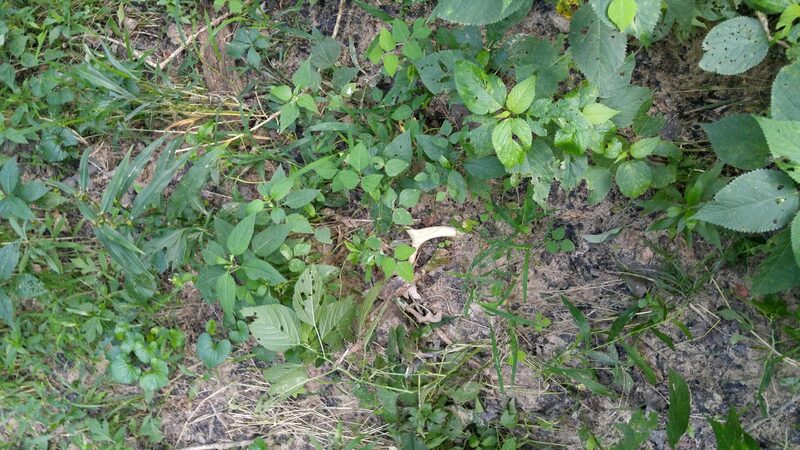 (Above) Sometimes antlers become buried, such as this 4 point side I found buried in sand on a creek bank. The key to spotting this antler was the bright reflection of the main beam sticking out of the sand. (Above) This old chewed up antler fades into the leaf litter, but an experienced eye can pick it out. (Above) One of my all time favorite finds was this antler that was completely buried except for an inch of the G2. I stepped right on this antler’s brow tine and felt it under my foot before I ever spotted it! Shed hunting is a very fun way to spend the late winter months collecting trophies and scouting for the upcoming turkey and deer seasons. Don’t be afraid to walk 5, 10, or 15 miles a day and just enjoy being outside and enjoying creation. If you are somewhat intentional while choosing your route and keep your eyes open you should start picking up sheds in no time! Good luck and happy hunting! Moriah is a co-founder of Hunt The Land and a graduate of the NC State University Fisheries, Wildlife, and Conservation Biology program. He is a published author in Quality Whitetails, Purdue University Extension, and is currently a graduate student at the Mississippi State University Deer Lab where he studies interactions between deer, oaks, and other hardwood trees. Post-Rut: What Do I Do Now? Try The Buck Age Quiz!